Noe took his first step! Yes, like, walking step. Without holding onto anything. I (Rani) saw it myself. It was in the bedroom. He was standing in the middle of the bedroom. First, he stood up from sitting position, without holding onto anything. The next thing he lifted his left foot, take a small step forward.... he kept standing up very very briefly afterwards before falling into sitting position again. Well, it was a first step indeed, although it was not a complete walk yet. 'tis the season to share our joy to others! We'd like to share with you something that might be useful for you. Allow us to present... A ringtone for your cellphone made from Noe's lovely baby laughter! Download here in WAV format (355kb) or MP3 format (165kb). We're in the process of migrating to the new blog engine, which hopefully can be launched by new year. Beta version is actually available, but it's still barren .. email or PM me if you wanna test the beta or help out.. thanks. Some december entries will be available in that location too. We went to Giant Supermarket to do our fortnightly shopping. We bought finger food for Noe to see whether he's ready to feed himself with hands. To our surprise, there is Ikan Lele / Sembilang / Catfish in IMM. We've been wanting to eat Pecel Lele and there is still leftover sambel pecel in the fridge, so Rani bought a pair of Lele. 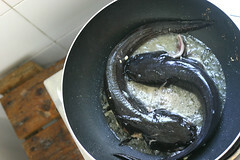 Look at how fresh and nicely they cook in the wok, just like a YinYang sign.